Corporate history of C.H. Schäfer Getriebe GmbH, its road from loom to precision gears. 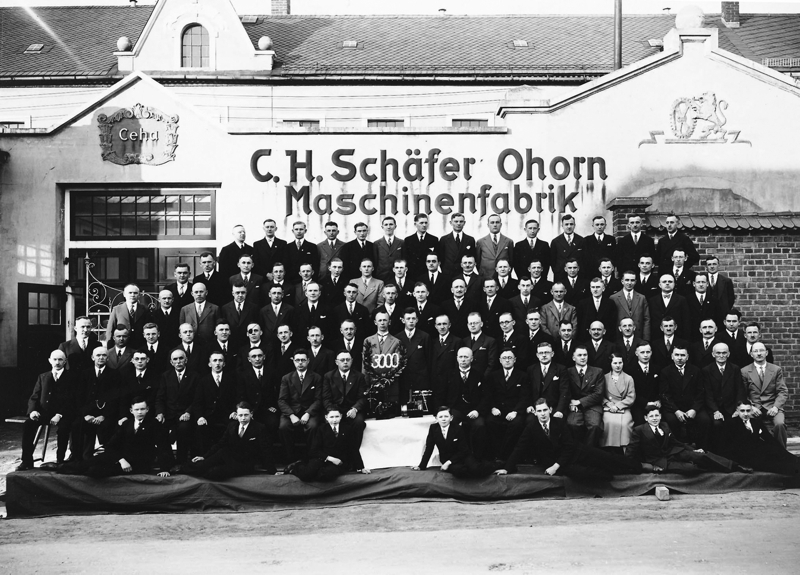 In 1873, the company was established in the Saxon village of Ohorn. In its first years, the company was a manufacturer of textile machines and, in particular, of mechanical looms. Initially, this machinery was entirely built from wood and used in the surrounding companies of the ribbon industry. At this time, there were 3 to 5 workers entrusted with the manufacturing process. 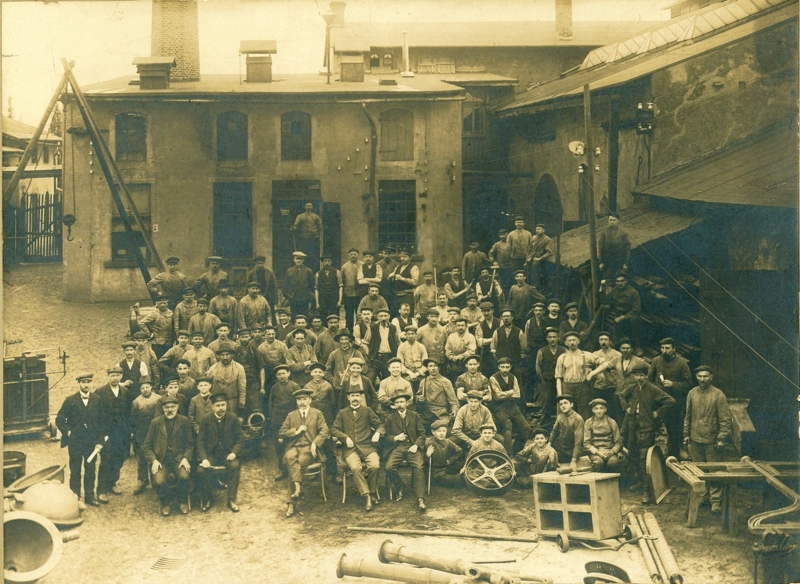 The photograph taken in 1896 shows the founder of the company, Carl Heinrich Schäfer (mid front), and his son, Max Schäfer (front left). Bitte lesen Sie im oberen Slider unsere interessante Firmengeschichte seit 1873. Das Zahlungsmittel "Mark" wurde 1873 eingeführt, aber konnte nur 129 Jahre alt werden. After Carl Heinrich Schäfer died at an early age in May 1906, his son Max Schäfer, a technical genius, became the next owner of the company. Already in his early years he realised that a loom with a geared drive could only be achieved through using gearwheels. In those days, however, mechanical engineering was still not fully developed in the city of Chemnitz, which is why the machinery required to produce gearwheels was only available as special solution thus being highly expensive. The manufacturing site was gradually extended under Max Schäfer. During this time, he developed the cross winding system. This way, the yarn could now be wound on cardboard bobbins. It was around 1911 when the company C.H. Schäfer started to engage in metal working. In doing so, the company had already taken a major step towards loom reliability. 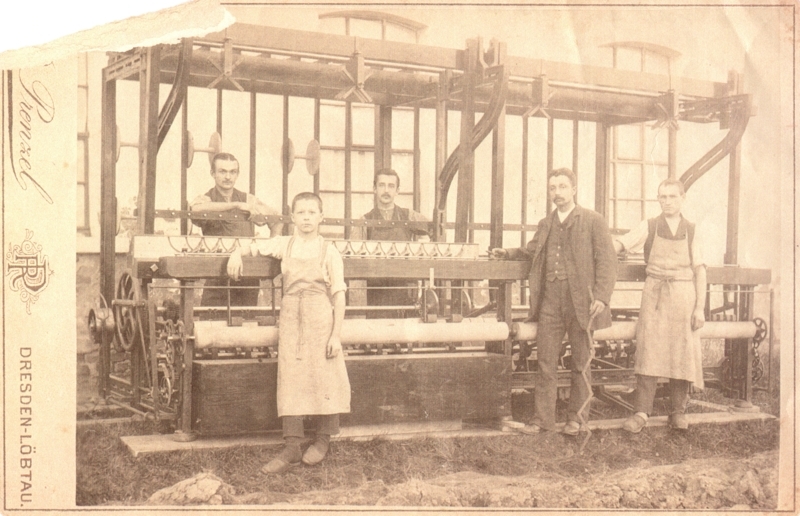 As can be seen from the photograph, the company produced its 1,000th winding machine in 1913. Later, in 1918, Max Schäfer invested in a steam engine named ‘Mobila’ for heating and production purposes. The first gear-cutting machine, produced by Pfauter in Chemnitz, was installed in the factory building around 1920. In order to increase the resistance to wear, it became necessary in 1923 to manufacture hardened gearwheels. For this reason, Max Schäfer made investments in heat treatment technology. 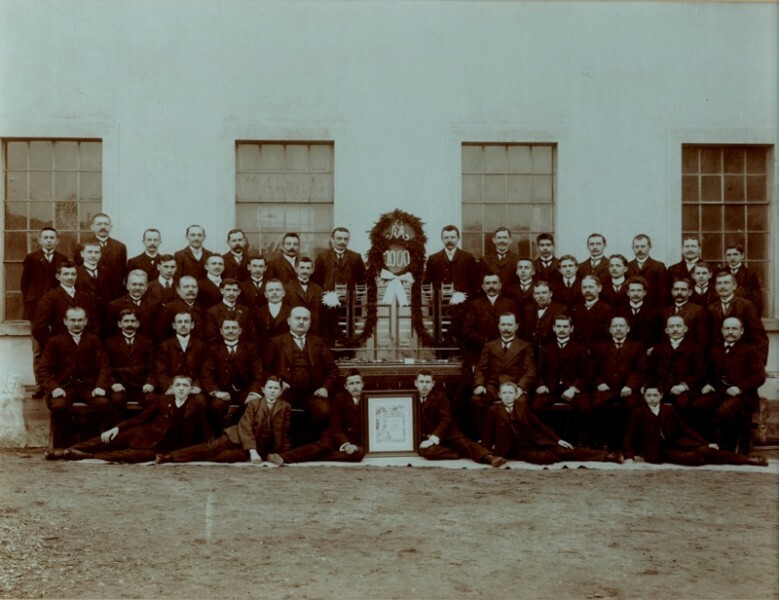 At this time, more than 80 workers were employed in the factory. The first bevel gearing machine, a milling machine used for manufacturing spiral bevel gears, was purchased from the Klingelnberg Company in 1931 bearing the serial number 7. The photograph was taken in 1934 to mark the assembly of the 3,000th winding machine. During this time, Max Schäfer developed the multistage power shift transmission and applied for a patent on this. It is used for drying coal or cement. In the last days of World War II, 90% of the manufacturing site was destroyed in a fire. The plant was rebuilt by the workers themselves within 3 months. Already in 1950, the number of people working for C.H. Schäfer again totalled about 200, and the company mainly produced mechanical looms, winding machines and the legendary multistage power shift transmission. Max Schäfer died in February 1953, and his nephew, Karl Schäfer, ran the company until 1969. In 1969, during GDR times, the GDR government expropriated C.H. Schäfer. Thereafter, the number of people working for the company was further increased up to more than 260. In the autumn of 1980, a new factory building was erected to improve the production process. In 1991, the company was re-privatised thus leading to the formation of C.H. Schäfer Getriebe GmbH. Since then, the Schäfer Company has invested more than EUR 30 million in production processes and maintenance. Today Schäfer employs 207 people and produces EUR 27 million worth of gearboxes and spare parts each year. A total of 57 of the company’s employees live in Ohorn. Of these 207 employees, 74% work in industrial positions, most of them in 3 shifts. Industrial spur gears, planetary gear units and bevel helical gear units weighing from 5kg up to 12,000kg and having a maximum dimension of about 1,100mm. Bevel gear units weighing from 1kg up to 2,500kg and with a cube dimension of up to 800mm. Spur gears with straight and helical ground teeth and a diameter of up to 1,000mm, most of which having ground teeth in quality 5 according to DIN (German Industrial Standard). Spiral bevel gears with a diameter of up to 600mm, most of which having ground teeth in quality 5 according to DIN (German Industrial Standard). In the upper slideshow you can read about our company’s interesting history that began already in 1873. The German currency “Mark” was introduced in 1873, but should last for only 129 years.